Mystic Aquarium, located in Mystic, Connecticut, was founded in 1973 and privately owned by Kelvin Smith. The location was chosen by the famed philanthropist and industrialist due to its proximity to the ocean coast and rich maritime history. The aquarium joined forces with Ballard Institute for Exploration in 1999 and underwent over $50 million in renovations. The aquarium is renowned for its beluga whale exhibit. It is the only place in New England to host them, as well as one of only three facilities in the United States that is home to Steller Sea Lions. In 2012, Mystic aquarium expanded again to open the Ocean Exploration Center. This exhibit featured maps, diagrams, models and stories of Dr. Robert Ballard’s deep sea explorations of The Black Sea, and the infamous wreckage of the RMS Titanic. There was even a live feed camera to the Nautilus ship where aquarium visitors could talk to scientists and explorers live to ask questions. Ballard is one of the most famous ocean explorers in the world, most noted for his 1985 discovery of the RMS Titanic wreckage. On the 100th anniversary, April 12th, 2012, Ballard opened the Titanic exhibit at the Ocean Exploration Center. This exhibit was co-built by a Disney animator and funded through United Technologies Corporation’s $1 million donation. In 2014, Stephen Coan, President of the Sea Research Foundation through Mystic Aquarium was honored to accept the National Medal for Museum and Library Services, proving that Mystic Aquarium was one of the best and most ecologically beneficial aquariums in The United States. The aquarium continued to grow through 2015 when the Titanic exhibit was remodeled to embrace a large, 7,000 square feet space for a new showcase called Exploration: Wild after Ballard unfortunately ended his relationship with the aquarium he had founded. Mystic Aquarium prides itself on their mission to get people up close and personal with the marine life at the aquarium. 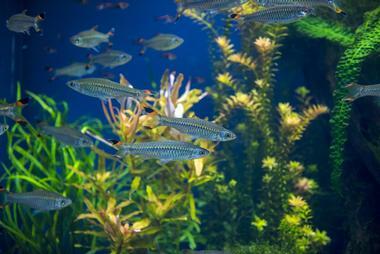 There are many interactive exhibits and opportunities to touch several of the aquatic creatures at the aquarium. Exploring the mystifying beauty of the underwater world has never been more exciting than at Mystic Aquarium. The Main Gallery at the aquarium is comprised of hundreds of tanks filled with thousands of different fish and sharks from all over the world. There are also some reptiles on display in this exhibit such as the loggerhead turtle and sea turtles. This main attraction of Mystic Aquarium houses several individual exhibits such as Shark Encounters! Where guests can touch the back of a real life shark and the Shark Lagoon where patrons can relax and watch the sharks in the aquariums close to natural habitat. The discovery room is also located in the Main Gallery and is a great spot for kids to play and explore. They can even pick up and handle a crab. Some of the other features of the Main Gallery include the coral reef exhibit, Jellyfish tanks, moray eels, barracuda, and Amazonian habitats. Sting Ray Bay is located just outside of the Main Gallery and is a very hands-on exhibit where visitors are encouraged to participate in handling the stingrays in the stingray pool. Children and Adults alike are delighted to lean over the edge and dip their hand into the salt water to feel the smooth backs of different species of sting rays. Foxwoods Marine Theater is a part of the Main Gallery where visitors can interact with California Sea Lions. Trainers put on a show of sorts for visitors in the upstairs pools to demonstrate the learned behaviors of sea lions and educated guests on conservation of the ocean and facts pertaining to sea lions. Downstairs, there is a large, underwater viewing area where guests can come face to face with these magnificent creatures. The sea lions will swim right up to the viewers on the other side of thick, glass walls. There are many seating areas in this part of the aquarium that allow guests to take a break and relax while still being immersed in the ocean world. The Roger Tory Peterson Penguin Exhibit is home to 35 African penguins and contains above ground and under water viewing opportunities. 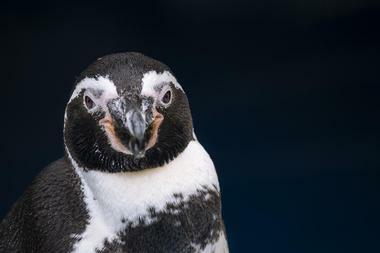 The African Penguin is currently on the verge of becoming extinct in our lifetime. Mystic Aquarium is a leader among conservation efforts to stop this tragedy from becoming a reality. The top of the exhibit is open air. Penguins can be seen waddling around on rocks and sliding across their habitats in play. This exhibit does not require to go underground to view the underwater lives of the penguins however as the habitat is raised so that guests can view the penguins swimming and diving into the water from eye level. Guests can also participate in penguin encounters in this exhibit. 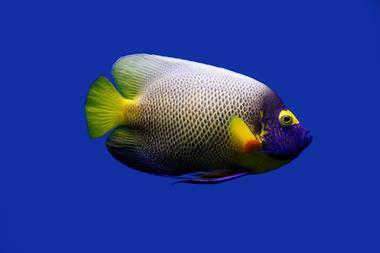 The program is in addition to aquarium admittance and is one-hour long. 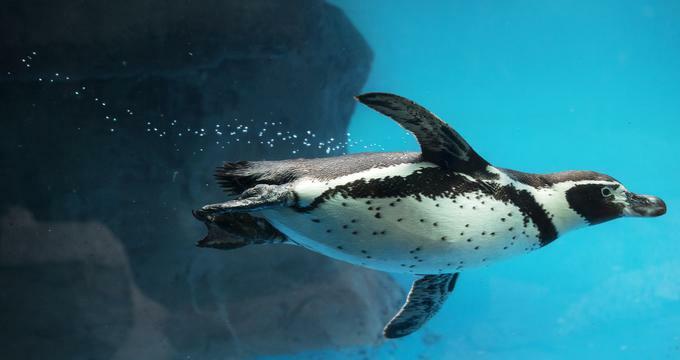 Those who choose to attend this special presentation are able to talk with and observe trainers interacting with penguins and gain in depth knowledge on the conservations efforts that the aquarium participates in for the African Penguins. Arctic Coast Exhibit is home to The United States’ largest beluga whale outdoor exhibit. This habitat is designed with actual glacier ice that spans one acre, streams, evergreen trees and crystal blue water. This exhibit also provides for above and below ground viewing tanks. In the above ground presentation, visitors can watch feeding demonstrations and learn from trainers the behaviors and conservation efforts extended to beluga whales. Below ground, there are three 20-foot windows where guests can watch the whales swim and glide through the water. The beluga whales also share space in this exhibit with two harbor seals that were rescued by the aquarium. Mystic Aquarium is leading the research of beluga whales. Marine biologists from Mystic Aquarium study these whales at the aquarium and also in their natural habitat, the arctic. Currently, research is focused on how environmental change, including human caused damage, affects the lives and well-being of these amazing marine mammals. Exploration: Wild gives visitors the opportunity to explore the rainforest and many other habitats without having to leave the country. Journey through the amazon, the arctic, the open ocean, and the American wetlands through several interactive stations that provide hands on learning and exploration. There are also many reptiles houses in this area of the Aquarium where visitors five years old and up, can touch and interact with bearded lizards, snakes, and other reptiles. Frogs! This colorful exhibit has nearly 40 different species of frogs from common toads to poisonous amazon amphibians. There are also several other amphibians in this exhibit, such as salamanders, from across the globe. 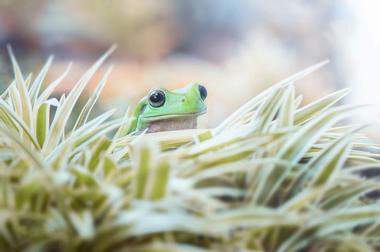 One third of all frog species are in danger of becoming extinct and Frogs! 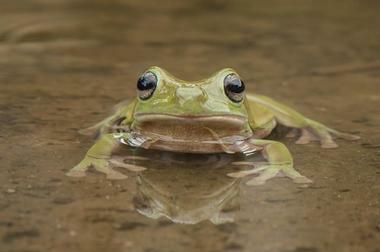 Focuses on educating guests, both young and old, on the importance of amphibians in an eco-system, conservation and the life cycle of a frog. Pacific Northwest Exhibit is where the seals and sea lions not housed in the Main Gallery can be viewed. This is an open air, outdoor habitat that is designed to resemble the natural ecosystem of these marine mammals. Visitors can watch the mammals at feeding times where trainers put on a small demonstration. The seals and sea lions spend most of their time swimming or sunning themselves on the beach! Marsh Trek is the area of Mystic Aquarium where guests can walk along a boardwalk and play I spy with the native east coast species and other creatures native to North America. Blue heron can be spotted soaring over the marsh where bullfrogs, ducks, turtles and fish call home. There is also natural vegetation in the marsh such as water lilies. Mystic Aquarium is much more than just a visitor attraction. 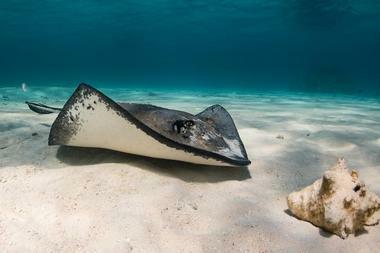 They are also an animal rescue clinic that provides care and rehabilitation for stranded and injured marine animals. The rescue team, on average, responds to 30 calls per year along 1,000 miles of North Eastern coastline. Aquarium visitors are welcomed and encouraged to take a peek into the clinic to see all the hard work and care that goes into bringing seals and sea lions back to health and reintroducing them into the wild, or transferring some to other aquariums throughout the United States. Mystic Aquarium offers several programs throughout the year that provides educational opportunities for visitors. There are summer camps and programs from children preschool through high school as well as special presentations for families that homeschool. One of the most fascinating programs at Mystic Aquarium is the Sea School. This school is the first and only accredited preschool program in The United States that is inside of an aquarium. There are even opportunities for overnight stays at the aquarium and programs designed for girl scouts and boy scouts. The overnight programs allow for families or groups to explore the aquarium after hours, when everyone else has gone home and the aquarium provides staff for the event. The scout programs focus on recycling and conservation efforts and how to implement them at home.